I've heard so much about LOA-law-of-attraction brouhaha. I don't know if it has ever been true or proven really. Neither I could prove it for the simple reason that I don't know how to do it. In another perspective, I don't think this so called LOA gurus will ever tell the truth or the so called secret. Bottom line is that if you want to know the "secret", you have to buy their books. Oh, yeah! Nice marketing. If I knew how to do it, I would tell everything to everyone, so to speak, without you buying any book. Anyway, I'm a writer and what I do is research. I'm a bit geeky that I'd rather read operation manuals than novel books. In fact, at home, there's a complete series of Harry Potter novel books. I opened the last of the series, which is ... I don't know what title was that ... perhaps "Harry Potter..." That after reading the first paragraph of chapter 1, I jumped – a high jump, indeed – to the last chapter to read the very last paragraph. I haven't opened a novel book since then. Now, back to law of attraction. I ask awhile ago, "Is there really a way to manifest money really quickly?" Hmm! Let's see what people say about it. 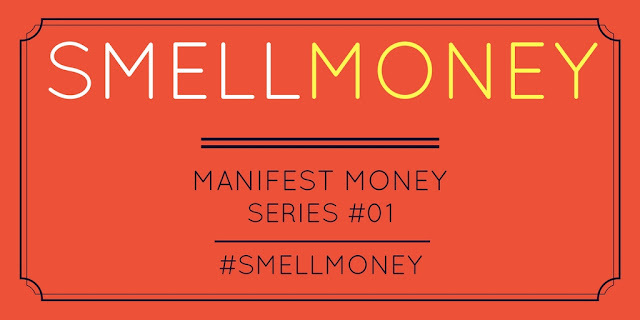 Welcome to Manifest Money Series. Each time you get hold of newly printed bills, smell the money. Memorize the smell. Get familiar with the smell. Put it in your brain. It's like you are putting data to your brain. It's not hard to do it. If someone wears your perfume, you exactly that it is your favorite perfume because you are familiar with the scent. You know it by heart. Apply the same thing with the scent of money. Be familiar with it. Now, don't smell the old bills. They're full of bacteria. You wouldn't like the odor. Smell the new ones – the ones that come out right from the mouth of ATM. At least, with newly printed bills, there may be just traces of germs. Bankers do not touch them with bare hands. They were gloves to protect their hands from cuts. Yes, a new bill can cut like a knife. Once you are already familiar with the scent of money, practice a little everyday recalling the smell of newly printed crisp bills even if you are not holding the money. If you cannot do it everyday, it's just fine. Don't stress yourself. You can do it occasionally or even just in a passing thought. Let others know if it worked for you by leaving a comment below. If it didn't, leave a comment as well.